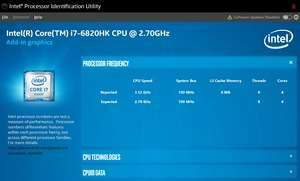 The Intel Processor Identification Utility is a software application developed by Intel as an official tool which displays information about the installed processors on a given machine. The tool itself will only work with processors developed by Intel as the name suggests, and will extract specific details about the processor(s) in a quick way and display it all in a readable format. The main interface of Intel Processor Identification Utility is tabbed and separates different details into separate tabs. Each tab will display information under Frequency Test, CPU Technologies and CPUID Data. Version 6.0.0211 is a freeware program which does not have restrictions and it's free so it doesn't cost anything. For security reasons, you should also check out the Intel Processor Identification Utility download at LO4D.com which includes virus and malware tests. Additional screenshots of this application download may be available, too. 4.8 out of 5 based on 74 ratings. Intel Processor Identification Utility download been highly rated by our users.